This is my first book by Kasia Bacon, but it won’t be my last. I was really impressed with this short story. I read a lot of short stories, and a lot of them fall short on being able to produce a complete fleshed out story with well-developed and complex characters and still manage to throw in some world building in such a short story. 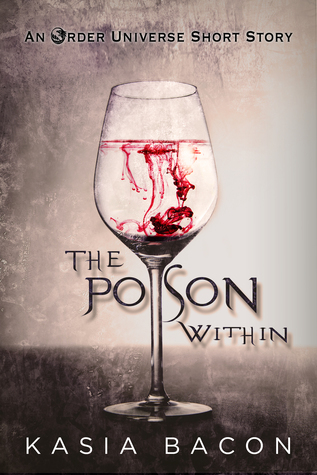 I am happy to say that The Poison Within by Kasia Bacon didn’t fall into that trap. This short story had well-developed and complex characters. The world that Kasia built for them was detailed and vibrant. The plot was exciting and had a hint of suspense to it that I found enjoyable. The story also had characters from two different social standings, and so they couldn’t be together openly. I also enjoyed the fantasy part of the book with the nymphs and Furia and a half-elven healer. The story also flowed nicely and was easy to read. The book has also been edited which is always a nice treat when reading a self-published story. The story takes place in Radvadur, the westernmost region of the Empire, neighboring the powerful Elven Country on one side and unpredictable wild tribes on the other. The political climate is strained and fragile, and a surge of Nymph refugees has stirred widespread hostility toward non-humans. Ellydhar Finn-Jánn, the Count of Radvadur, is the lover of Inspector Käyru Skaer. Talk about two people from vastly different social standings, but they complement each other very well. And even though they have to keep their relationship hidden, I never got the sense from Elly that he is ashamed of Käyru for being an Inspector and so far beneath him in social standings. The heart wants what the heart wants. But being the lord of a province riddled with unrest and flooded by a surge of Nymph refugees took up a huge chunk of Elly’s time and health. Elly’s father died of lung disease at a young age, and when Elly develops a cough, he refuses to see a healer, afraid that he will be told that he has the same disease as his father. While they are at an inn on the outskirts of the town of Azlě, Inspector Skaer is called to a crime scene and with the help of his lover, they will unravel who the murder is and get a precious gift in return. The relationship between Elly and Käyru started out as temporary and of no consequences but as their circumstances change, will they find the courage to risk their hearts? The chemistry between them is hot, and I can’t wait to see what awaits them in the next book in the series.